Benson and McLoskey report – The first Axedale Fair was held at The Campaspe on Monday last, and resulted in a greater success than the most sanguine of the promoters could have anticipated. From an early hour in the morning, cattle, horses, pigs, &c, were to be seen coming at intervals, in all directions, and before 12 o’clock, the stock yarded and penned, numbered from 400-500 head. The farmers, squatters, and residents from the surrounding districts, assembled in full force and the support and encouragement accorded by the land and proprietors of the Wild Duck Creek, Heathcote, Coliban, Kimbolton, Miami &c contributed in no small degree to starting the fair on a good footing at the outset. There were buyers present for all classes of stock at good prices, and although in some instances, high reserves stood in the way of business, there were nevertheless, a large number of sales affected by auctiom, to say nothing of the dealings amongst the farmers themselves. There were about 100 pigs penned bit this was not sufficient to meet demand, as fully One or two hundred more fat pigs could have been placed at very good prices. Dairy cattle brought from 1.5 to 1.8, young calves 6s6d to 20s, stores 1.2 10s to 1.3 6s per head; light, useful horses from 1.5 to 1.9 per head. No sales of heavy draught horses were affected by auction. 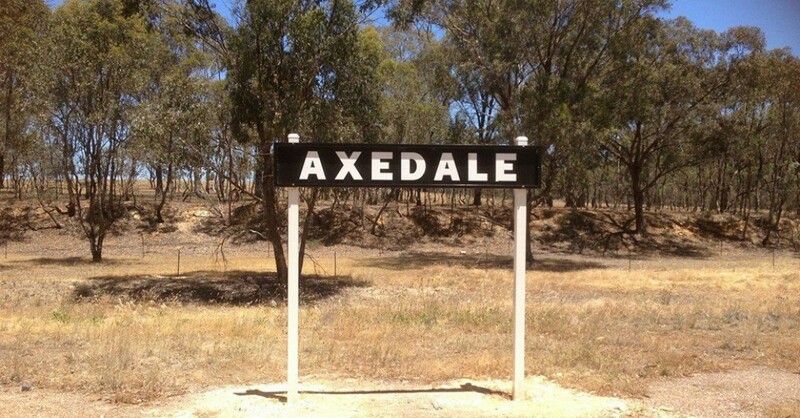 It is intended in future to hold regular fairs at the Axedale township upon the first Monday in every month; notice of which will be duly advertised. This entry was posted in Axedale, History, Uncategorized and tagged Axedale, Bendigo, History, TroveTuesday by Jennifer Jones. Bookmark the permalink.